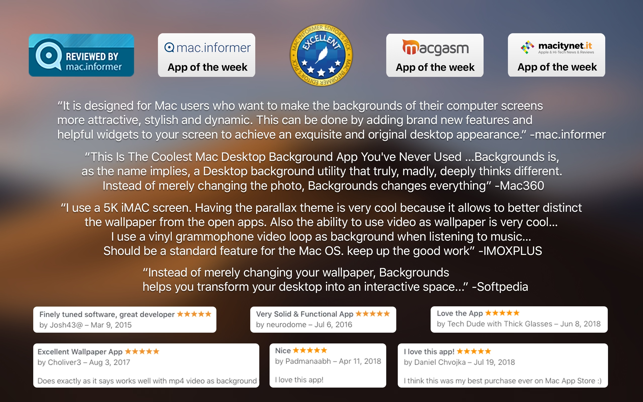 Make your wallpaper more interesting and useful with 7 themes: Music, Parallax, Video, Quartz, System, Clock and Web. • Compatible with iTunes, Spotify and Swinsian. 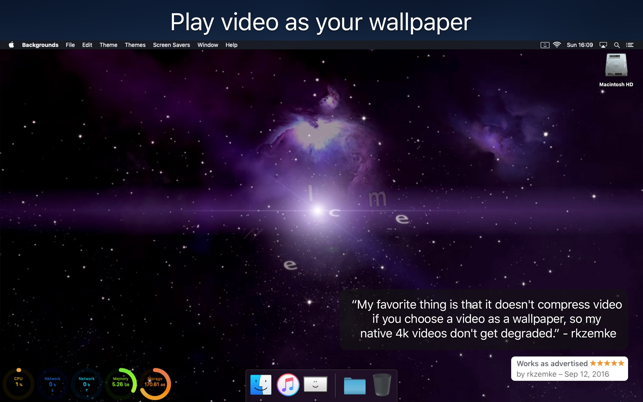 • Take advantage of your Panoramas and create immersive wallpapers. • Access to iTunes, Spotify and Swinsian current track info. • Get a glance of your system’s stats from Notification Center with the today widget. Know the time or date right from your Desktop. Monitor your CPU and Network usage. Check your Mac’s stats right from the Notification Center, wherever you are, without leaving your apps. 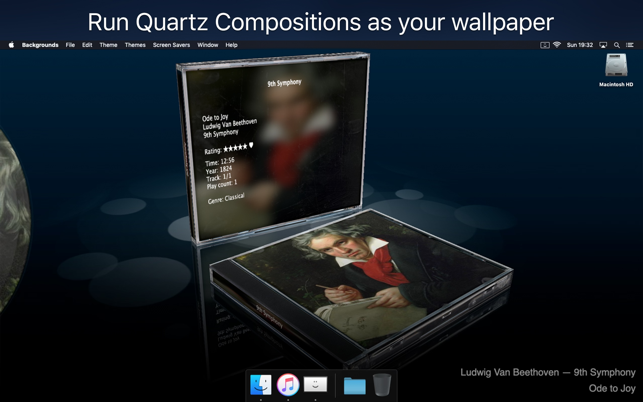 • Quartz X: Run a Quartz Composition while you are away from your Mac. Visualize your music artwork and info when playing music with iTunes, Spotify or Swinsian. • Glass: a transparent Screen Saver. Lock your Mac and see what it's doing, from your music artwork, to a task in progress, the system status, anything. • Supports Multiple Monitors with different preferences each. • You can even combine them. Activate the System and Clock widgets so they are always on top, even when you are using other themes. 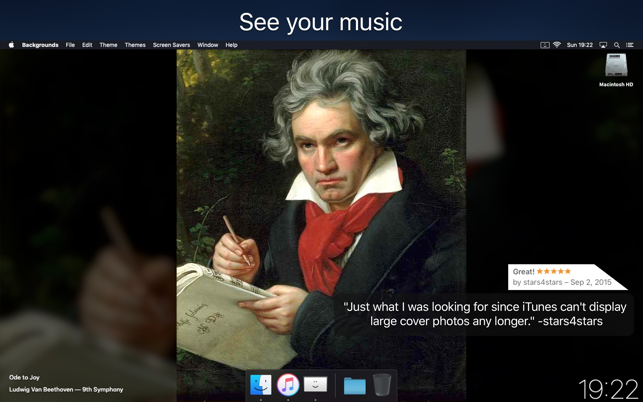 • Set an idle theme so when your Mac is idle it automatically activates a theme even in full screen so you can watch a video, see your music artwork, the system stats and more. Enjoy it, spread the love and share it with your friends. Thank you for making Quartz Composer work again in macOS Mojave. (Apple's built-in screen saver dropped support for .qtz files.) Not only do my Quartz compositions now function again as screen savers (with the included Quartz X module) but they can also work as animated desktop wallpapers. No problems here. the quartz option in the menu bar doesn't work, only for a few seconds. please fix the quartz option in the menu bar it keep crashing and and won't let me open and can't select a different option. Have you tried a different Quartz composition? Which one are you using? Try opening it while holding Option (alt). It should restore the default preferences. Do you have more information to help us diagnose it? What theme are you using? Have you tried deleting the preferences? What Mac are you using?